PCC Deli’s Methow Valley Salad has won the hearts of many. Hearty, fresh greens mixed with herbs and Bluebird’s signature Farro. Soak farro in water overnight. Bring water, pre-soaked farro, and 1/2 teaspoon salt to a boil. Reduce heat to low and simmer covered for 45 minutes. Drain in a colander and let cool slowly at room temperature. Do not rinse. When cooled, place in a large bowl and refrigerate. Mix together lemon juice, garlic, dill, basil, remaining salt, pepper, and both oils until dressing is blended. Toss dressing with grain, tomatoes, cucumber and carrots. 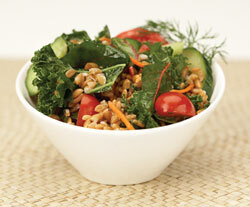 To serve, toss equal parts farro-vegetable mixture and loosely packed greens in a bowl.